On a warm evening in late September, a crowd of Albuquerqueans gathered in Civic Plaza for “Food Friday” - a weekly event where community members come together to enjoy craft beer and food from local chefs and food trucks. 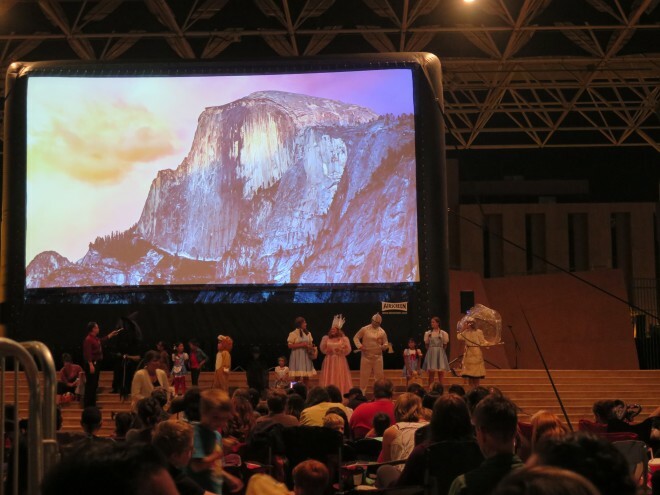 Nearby, hundreds of eager film fans congregated around an army of folding chairs and blankets, all in anticipation of the city’s first large-screen showing of The Wizard of Oz in over twenty years. Onlookers admired a huge chalk image of Albuquerque, which had been painted earlier in the week by a group of LA artists. A few years ago, this scene would have been largely unimaginable in Civic Plaza, which was built during an era when, with the exception of major civic buildings, large open concrete plazas were the only game in town for public spaces. What is remarkable is not simply that this event happened, but the fact that it was not an isolated event at all - in fact, you will find a similar scene taking place every Friday at Civic Plaza. What made this particular evening unique, though, is that it marked the official celebration of Albuquerque as the latest recipient of the Southwest Airlines Heart of the Community grant. 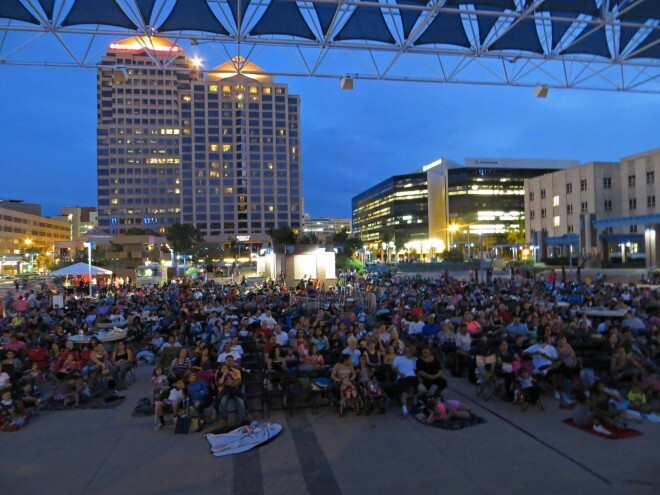 While there has been programming in this space for the last several years, the funding and technical support from PPS enabled Downtown Albuquerque to bring these events to the next level. The grant gave them the push they needed to really get the ball rolling, and it has helped them to secure other sponsors and sources of funding in order to maintain the plaza and expand its roster of cultural offerings and community events. The turnout for the event was impressive, with an estimated 800-1000 people in attendance. (The Wizard of Oz is a big draw - who knew?). While it’s certainly impressive on its own, this event is the culmination of a collective grassroots effort that has taken a little-used space and turned it into a true city square, one that serves as an activity hub and a major destination for the whole downtown. 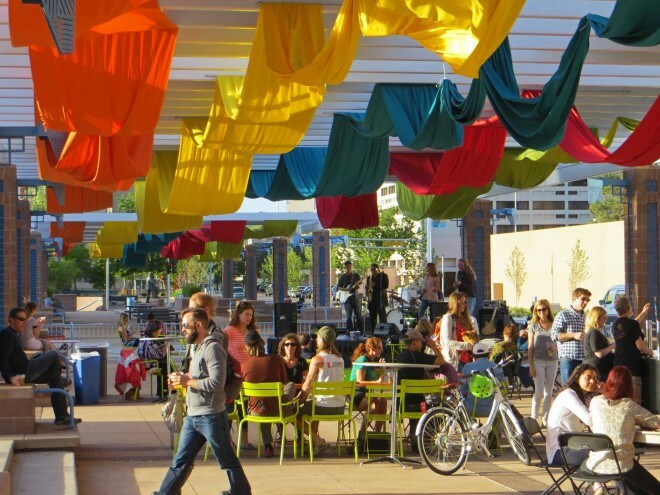 Lola Bird, Executive Director of Downtown Albuquerque, explained that this project was markedly different from previous public space projects in the city. In the past, they used a project-driven process: City government would say “this needs to be fixed,” and their team would make it happen. This was the first time the community itself drove the effort, by both identifying the problem (a rarely-used public space) and coming together to define simple solutions. “It was a watershed moment, Bird said. “It was not only a community-initiated process, but a community-driven process.” All of the ideas that were eventually implemented with the Heart of the Community grant came directly from the community itself. The change was noticeable even to an outsider. PPS founders Fred Kent and Kathy Madden attended the launch, and they have been involved with the project since the grant was awarded. Kent was especially struck by the palpable feeling of community at the event: “It’s a really passionate group of people who love the city, love what it is, and love what it could become,” he said. The success of this launch is only the beginning for Civic Plaza. Just this past weekend they screened a simulcast U.S. v. Mexico soccer match, and soon the plaza will feature regular amenities like play equipment for children, more music from local and national artists, and a completely refurbished Airstream Trailer that will serve as a full-service restaurant. “It’s fun, it’s attractive, and now we want even more,” commented Bird, who is excited about the community’s positive and ambitious vision for the future of the plaza. The community's enthusiasm and engagement has been noticed at the highest levels of government. The Mayor, CEO, and City Economic Development office have all taken note and are working with the downtown community to build a network of destinations, all centered around Civic Plaza. Every city needs its great square, and it looks like Albuquerque’s has finally come into its own. We’re excited to see how this momentum will continue to affect the rest of the city!